Hi Please I want to know how to colour Modeling chocolate say if I want to decorate a cake & make an emblem & it has red in it how do I do that with Modeling chocolate? Hi Louise, This is something I don't have a lot of experience with. I will ask my Facebook friends to add their ideas. But I believe you can add gel food colors to white chocolate modeling paste. I am assuming you are talking about white chocolate? I also would try using the food coloring as paint with a small brush. Do you have any cake shops around you? They usually carry different colored candy disks. Or use the Wilton melts. If you need a little deeper color in it make sure you use CANDY COLORS with them. Regular Wilton colors won't work. Most people prefer the Americolors now and they have regular and candy colors. Look up candy clay and there are several sites with the recipe. I recently used Americolor gel color to make modeling chocolate and it came out great-you want to use gel color, not liquid color, otherwise the consistency will change. Just make sure you mix the color well, otherwise it will streak. 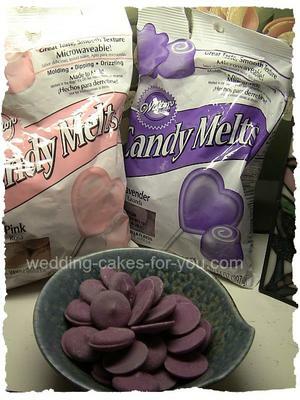 I usually make the modeling chocolate myself and I will use the red candy melts if I need a lot of it. I have used the Wilton gel colors to tint small amounts of modeling chocolate. Hope that helps! I have a question about painting on chocolate figures and how far in advance can you make them? Hi Jenna, I assume you are talking about white chocolate figures? I have experience working with dark chocolate modeling paste. I believe you can paint on the white chocolate using a tiny bit of clear almond extract mixed with some coloring after the figures have hardened a bit. You should be able to make them ahead and store them in airtight containers. Hope this helps. If anyone has suggestions please feel free to add your ideas.